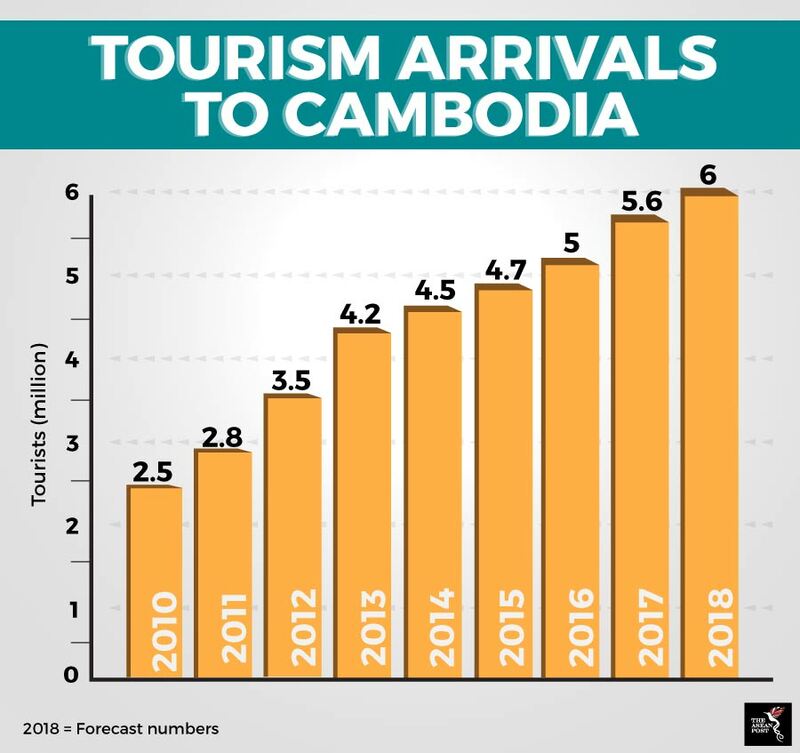 Last week, Cambodian Prime Minister Hun Sen claimed that the number of tourists visiting Cambodia had increased substantially over the years and now the country is expecting 12 million tourists by 2025. He was rationalising the building of new airports in Phnom Penh and Siem Reap to 18,000 workers in the Kandal province. The prime minister also claimed that Cambodia expects to welcome as many as six million tourists this year. According to official statistics from Cambodia’s Ministry of Tourism, six million tourist arrivals in 2018 is a logical enough number. In 2017, Cambodia was already close to that figure with 5,602,157 tourist arrivals. In 2016, it was 5,011,712; in 2015, it was 4,775,231; in 2014, it was 4,502,775; in 2013, it was 4,210,165; in 2012, it was 3,584,307; in 2011, it was 2,881,862; and in 2010, it was 2,508,289. However, looking at the numbers from 2010 to 2017 or even 2018’s forecast, questions arise whether the country will be able to reach its ambitious number of 12 million tourists by 2025, which is seven years away. Looking at the previous seven years from 2010 to 2017, the total difference in the number of tourists between those years is 3,093,868. If trends continue then that number, added to the current forecasted six million tourists only makes up a little more than nine million tourists by 2025; still three million shy of the 12 million goal. Be that as it may, Hun Sen and the Cambodian government seem confident enough in achieving their targets. Advances in future technologies including ease of travel may actually help the country meet its goal. With regards to “ease of travel”, the Cambodian government has plans in place to make it easier for tourists to enter the country. According to a letter from the Council of Ministers in January, Cambodia plans to build a new airport on a 2,600 hectares plot of land in Takhmao city, Kandal province. The project was announced on 11 January, 2018 during a signing ceremony for an investment project between Pung Khiev Se’s Overseas Cambodian Investment Corporation (OCIC) and a Chinese company, which was presided over by Chinese Prime Minister Li Keqiang and Hun Sen. The new airport is capable of accommodating the Airbus A380-800 and Boeing 747-800 aircraft, and will cost around US$1.5 billion to build, of which US$1.1 billion is a loan from a foreign bank, US$280 million comes in the form of investments from OCIC; and the remaining 10 percent is from the government. Another airport will be built on a 1,700 hectares piece of land in Siem Reap’s Sot Nikum district with a capital investment of US$900 million with a 55-year contract under Angkor Air International Investment Co. Ltd., a Kunming based company in the Yunnan province of China. Cambodia will also have a new airport in Koh Kong province’s Botum Sakor district, with an investment of US$350 million from the Union Development Group. In total, the three airports will cost US$2.7 billion to complete. Considering the fact that tourism contributes significant revenue (https://theaseanpost.com/article/cambodias-tour-guides-face-tech-disruption) to Cambodia’s economy, the US$2.7 billion could be viewed as a long-term investment. However, that does not excuse the fact that it is a lot of money and Cambodia is already facing the looming threat of its largest trading partner, the European Union (EU), ending its Everything But Arms (EBA) trade deal with the Kingdom, following allegations of a false election and oppression of the country’s opposition. This, in turn, could be one of many reasons why the Cambodian government at least seems to be changing its previous nonchalant stance of ignoring the EU’s demands. Recent reports (https://theaseanpost.com/article/cambodia-ease-grip-opposition-and-media) have shown that banned opposition members may be allowed back into political life and shuttered media outlets could reopen as the EU considers pulling a trade deal that Cambodia is loath to lose. Cambodia's Ministry of Foreign Affairs said in a statement that Parliament was reviewing legislation allowing "individuals who were banned from politics to resume their political activities". The decision was made in the spirit of national reconciliation and to broaden the democratic space. The statement did not mention the EU deal but said court cases involving unions could be expedited and news outlets like the feisty English-language Cambodia Daily could be allowed to return if it paid errant tax bills. It added that US-backed Radio Free Asia, which also shut during escalating pressure on the media, was also welcome to reopen its office. It is more than likely that the EU will continue with its EBA if the ban on opposition politicians is lifted, and this would certainly be good for Cambodia’s tourism targets. There are still some creases Cambodia will need to iron out to bring in the kind of tourist arrivals it wants by 2025 but the country seems to be on the right track.